When I saw this recipe for Slow Cooker Sausage, Potato and Cabbage from Graceful Little Honey Bee on Pinterest a few month’s ago I knew I had to try it out because it looked delicious. 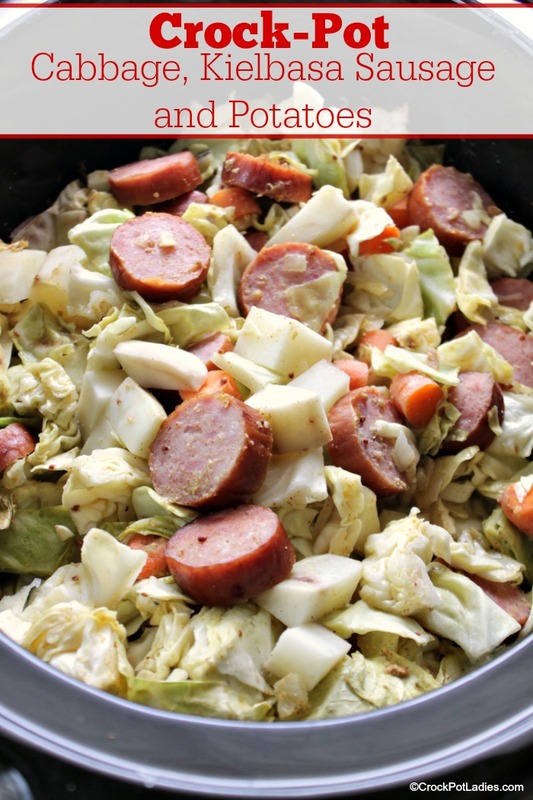 I purchased a head of cabbage and some kielbasa sausage at the grocery store and headed to the kitchen to make it. It was quite lovely. But… my house is full of food critics. From my husband on down to the youngest child, they all have something to say about the food I make them and often have suggestions for how a dish could be improved upon. So while the original recipe is great I went ahead and adapted it a little bit to enhance the flavors but without straying away from the frugal recipe that it is. Again, I headed back to the store for another head of cabbage (luckily they have been on sale recently due to St. Patrick’s Day) and this time I got some turkey kielbasa sausage just because I am on Weight Watchers and am trying to make healthier choices. You can of course use regular kielbasa sausage. Apple cider vinegar instead of white distilled vinegar, and more of it. I think apple cider vinegar adds another flavor dimension and we thought the dish could use a little bit more zip. Spicy brown mustard instead of yellow mustard. Maybe it is just a personal preference but I prefer a more grainy mustard and like to leave the bright yellow mustard for the occasional hot dog. Seasoning salt and pepper…the original recipe calls for “salt & pepper to taste” and my husband grabbed the seasoning salt and we all ground some pepper over our dinner. So the second go around I just included that in the recipe. Chicken stock instead of broth. Either would be fine but since stock is reduced a little bit more than broth it carries more flavor. Plus it is just what I buy and keep in the pantry. I use fat free because again, I am trying to make healthier choices. Minced garlic. My husband LOVES garlic and I agreed with him that it could use more garlic than the garlic powder provides. So a couple cloves of minced garlic went in the pot. Overall this is a pretty forgiving recipe. Feel free to add more or less of any of the ingredients. Have fun, eat and enjoy! This flavorful recipe is easy and takes less than 15 minutes of prep time and tastes delicious. 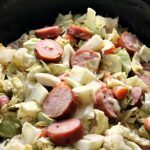 Cabbage, kielbasa sausage, potatoes and carrots are cooked for several hours in the slow cooker with a few other ingredients to make for a tasty dish that is full of flavor! 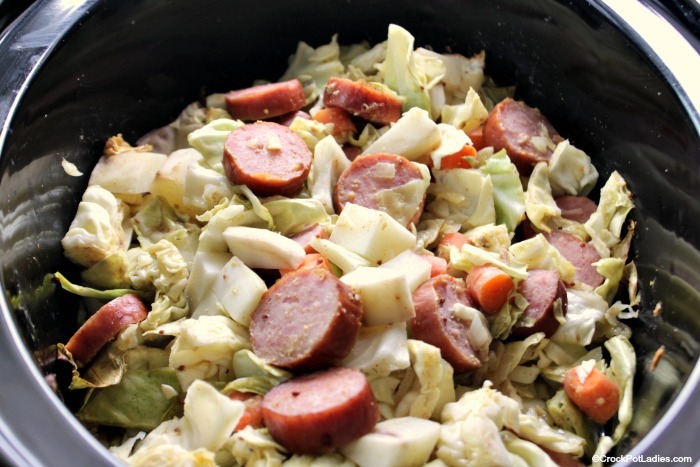 In a 6 quart or larger slow cooker layer the potatoes, carrots, cabbage, kielbasa, and onion in that order. In a small mixing bowl, whisk together the chicken stock, apple cider vinegar, mustard, minced garlic, seasoning salt, garlic powder, onion powder and pepper. 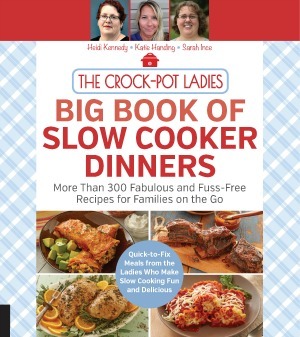 Pour liquid evenly over the top of the mixture in the slow cooker. Cover and cook on LOW for 6 to 8 hours or until the potatoes and carrots are tender. Thank YOU for sharing your recipe with the world. Dropping by to say thank you for sharing this recipe. We had it last night and my family loved it. It was a great way to enjoy some vegetables. It was light but very filling. This is a must-try for everyone. I am so glad you enjoyed the recipe Sheila! Could I replace the potatoes with egg noodles? I don’t think egg noodles would cook the same in this dish in the crock-pot without turning mushy. You could cook them on the stove-top according to the package directions and cook cabbage and kielbasa in the slow cooker. Then, add the cooked noodles right before serving. Thanks Sandra! That is always so nice to hear! Sounds great Marlitt, I love the idea of adding some Creole seasoning! I made this using Brussel sprouts instead of cabbage a few weeks ago. I used vegetable broth, and substituted some Guinness stout for the vinegar. It was very good, but the Brussel sprouts were a bit overcooked.. I plan to add them later next time. Thanks for the recipe! Brussels Sprouts sounds like a great substitution Kevin! Fantastic in fact. I am going to have to try that myself as my family loves them!